MTN has finally reduced the data cap on the mPulse plan from 1.2GB to just 350MB for the same N150. Now that most of the available browsing cheats have either been blocked or reduced, I will soon drop a post on all the list of affordable data plans until something new comes up. For Glo users, the Glo Oga SIM offers some of the most affordable data plans you can get at the moment. With this offer, you will get 125% percent bonus on all data purchase. 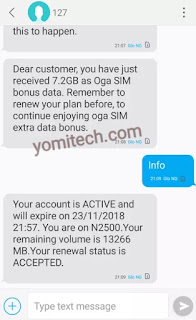 This means, if you buy N500 worth of data plan, you will get 1.8GB instead of the standard 800MB, N1000 will give you 3.6GB instead of 1.6GB, N2000 will give you 8.26GB instead of 3.65GB and N2,500 will give you 12.9GB instead of 5.75GB. i av so many questios for u Yomi, pls provide accurate answers. Will i still be eligible for glo oga sim after all d below conditions are currently occuring on my glo sim. 2. never subscribed on it--only bought it for and have been using it for freebrowsing. 3. how can i know i'm now on glo oga sim (for old sim) b4 starting to subscribe? 4. d glo sim is constantly in d fone, though no credit and no data.